I put a lot of thought and internet time into imagining the Glaurung and how to represent it on a table. I knew from the start that I wanted an actual wargaming piece, something that could be played with, not a model full of intricate detail. Perhaps the most practical solution would have been to make something myself, but I didn't think my modelling skills were up to the challenge, and, frankly, I would rather spend the time painting more miniatures. So, I had to look at ships that were commercially available. At this point, it was also important to decide what the ship might actually look like. Tolkien doesn’t give much detail about any of the ships of Middle-Earth, so I felt pretty free to make up my own mind. 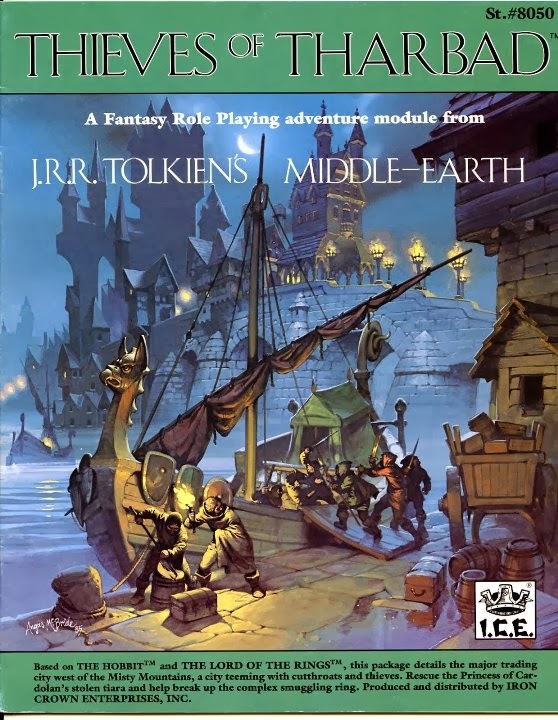 I spent a lot of internet time looking at supposed ships of Middle-Earth, but I kept coming back to one image, a painting by the late, great Angus McBride, which appeared on the old Middle-Earth Role-Playing supplement, Thieves of Tharbad. Great cover. Of course, the ship pictured here is obviously a merchant vessel of some sort, whereas my Glaurung would be a warship. Generally, warships are longer and narrower than merchant vessels. It seemed to me that a longer, narrower version of the McBride ship would look something like a large Viking longship. Lucky for me, the longship is probably the easiest naval vessel to find for 28mm miniatures. I looked at a lot of different manufacturers, but none of them seem to have everything I wanted. I wanted a flat bottom, so it could rest on the table. I wanted as few pieces as possible. I wanted the deck to be generally flat and open so that miniatures could easily stand. Finally, I wanted it to be large enough to be impressive and have plenty of room for a lot of figures. I didn’t really expect the ship to hold all thirty of the Glaurung's crew, but I at least wanted enough room for the ten heroes. After several weeks of searching, I had almost given up. Then I saw the newest issue of Miniature Wargames magazine, which had a really nice article on playing the Viking Wars. This included lots of pictures, including a couple of a longships I had not previously seen, manufactured by Gripping Beast. 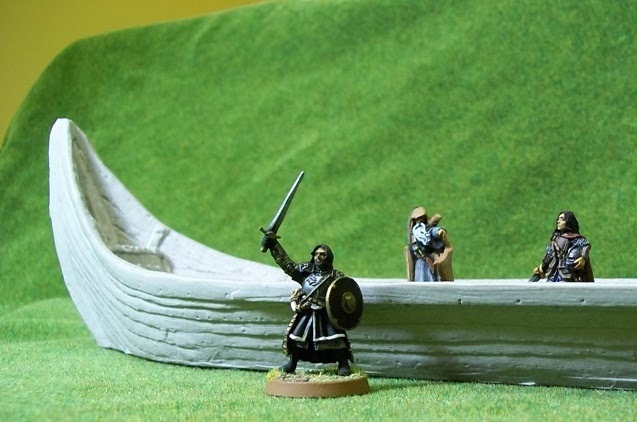 I’ve ordered figures from Gripping Beast before, but had not thought to check if they had a Viking ship, and strangely it had never come up in any of my searches. Anyway, yesterday being payday, I ordered one. Amazingly, the ship arrived today, carefully packed. Most of the ship is one single piece of resin. The dragonhead and tail, and a few other details come in metal (as does a dozen or so rowers, which are of no particular use to me at the moment). It’s an impressive piece. There’s some work to do. First I’ll need to file down some of the extra resin, but this looks pretty minor. I need to decide what to do about the dragon head. I’m not that keen with the one it came with, it looks a little too much like a dog, but I don’t have a specific alternative at the moment. I probably won’t attach most of the detailing, as I don’t want to worry about knocking it off. I'm still pondering what to do about the mast. I'm not sure if I want to just stick in a down to represented it, or make a full sail. The sail would look cooler, but might get in the way of gaming. Also, I'm thinking about adding a small covered room at the back, like the tent on the McBride ship. Again, I don't know if my modelling is really up to it. So, the shipwrights still have a lot of work to do, but Breged, Mandracoth, Valetha, and a few of the Guards of the Tower have come to see how it’s going. Coming in April from Dynamite Comics. 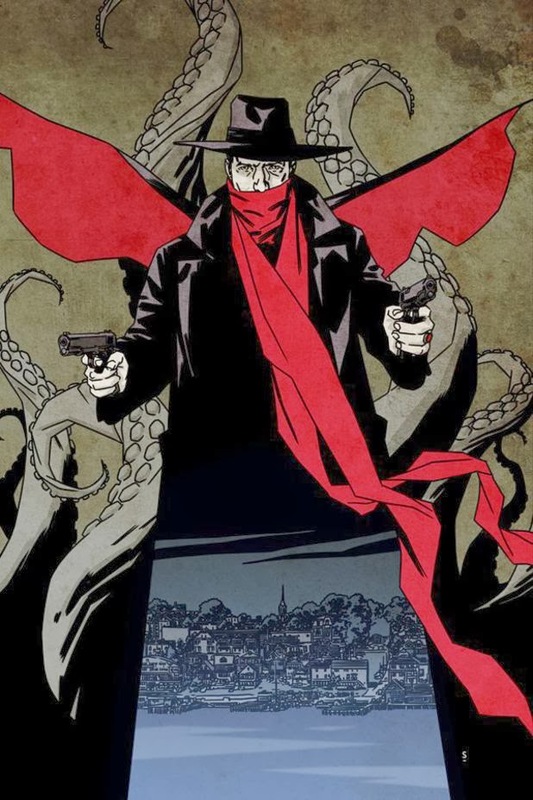 I haven't been overly impressed with the work that Dynamite Comics has done with The Shadow license (although they've produced a few tremendous covers). I have no real reason to think this one-shot comic will be any different. But, it combines my favourite pulp hero with my favourite H.P. Lovecraft story, so I will probably have to pick it up. Born and raised in the city of Snowborne in Rohan, Halvarn has spent most of his adult life on ships, raiding the towns of Near Harad and the outlying settlements of Umbar. 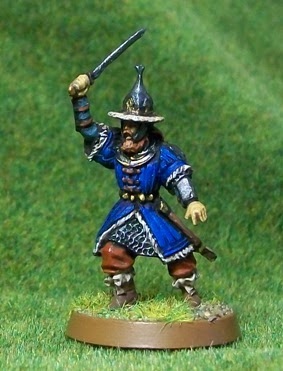 While the Steward of Gondor is more than happy to encourage and give refuge to such reivers, they are generally considered to be dangerous, ill-disciplined men. Most folk view them as little better than the corsairs and want nothing to do with them. When Halvarn volunteered to join the crew of the Glaurung, Mandracoth advised against accepting him. 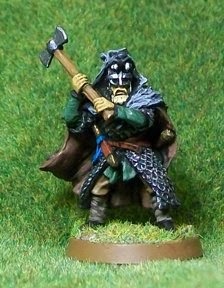 Breged overruled his friend, however, for besides his mighty axe, Halvarn brings one very important asset to the company. He knows the shores and the dangerous lands to the south. He knows the safe harbours and friendly villages. Most importantly, he has seen Umbar. When planning the voyage, Breged and Mandracoth knew there would be one great challenge, even before they sailed off the edge of the map. How to slip past Umbar, the capital of the corsairs? With Halvarn as part of the crew, the chance of passing through corsair waters undetected is greatly increased. Unlike any of the previous volunteers, Halvarn is the only one to demand that his claim to a share of any and all treasure recovered during the trip be put in writing. 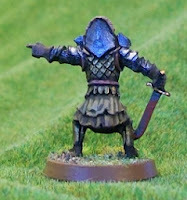 As with most of the crew of the Glaurung, I chose the figure first and then created the background for him. 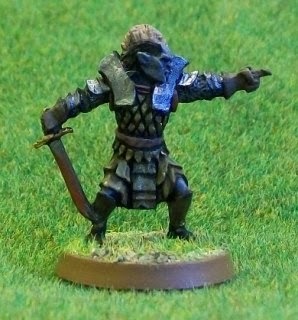 Halvarn’s figure is actually a Dunlending hero. The pack came with both a mounted and foot version of the figure. I haven’t painted the mounted version, but I will at some point. I decided he would be from Rohan for three reasons. First, I don’t currently have a hero from Rohan, and though Halvarn is perhaps not who the Horse Lords would choose for their representative, he’s better than none. I also thought his armour looked more in the Rohirrim style than the Gondorian style. Finally, since I have a mounted version of the figure, it seemed right to give him a riding background, even if he is basically depicted as a Viking. The figure was a lot of fun to paint. Lots of hard detail that was easy to pick out. 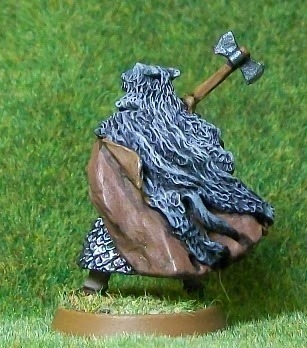 Also because of the heavy cloak, it is a very chunky figure with some nice heft to it. 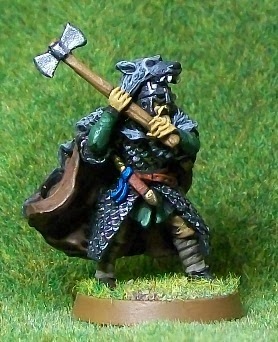 Finally, I love painting fur, such as his wolf skin cloak. Nicely sculpted fur is probably the easiest detail to paint and have look really good. Just a few layers of dry-brushing really bring it to life. Although pricey, this figure is still available in metalfrom Games Workshop. If you want one, I wouldn’t wait around. The Lord of the Rings figures are disappearing from their webstore at an alarming rate. Amongst the many gifts given to me by my wonderful wife this Christmas was The Light at the End, Big Finish Productions’ contribution to the Doctor Who Fiftieth Anniversary celebration. This release was eagerly awaited by fans of the Doctor Who audio dramas because it promised to bring together all of the living 'classic' doctors (Tom Baker – Paul McGann). I finally got a chance to listen to the adventure over the last two nights while doing some painting, and I’ve got to say, I’m rather impressed. Despite having to give time to all five doctors, as well as a few choice companions, and the Doctor’s greatest enemy, The Master, author Nicholas Briggs actually managed to construct and interesting story. Okay, it’s a complex ‘time folding in on itself’ affair, which probably takes an experienced sci-fi fan to really follow, but hey, it’s got to be somewhat complicated to bring five versions of the same person together from different points in their own time line...right? In fact, my only disappointment about the adventure was the inclusion of the first three doctors. Although they play only a minor role, and I understand the author’s desire to get them in, I found it distracting. The use of voice impersonators meant that I had to really concentrate to try and figure out which Doctor was speaking – not that it really mattered – as the first three doctors basically operate as one unit for the purposes of the story. That is a minor quibble though. 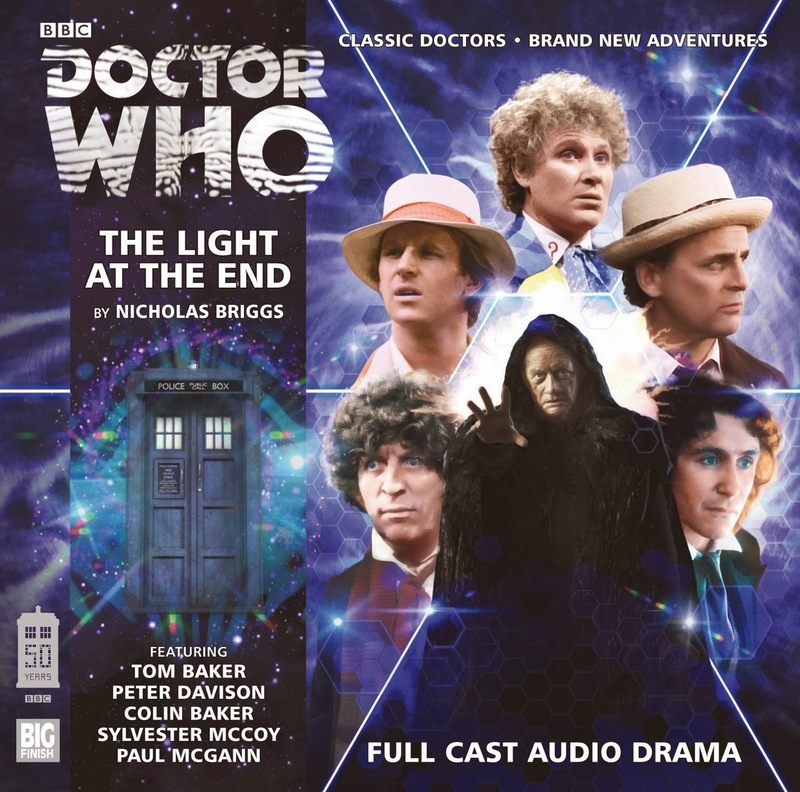 All in all, The Light at the End is a fun adventure in the spirit of The Five Doctors, and a nice way to wrap up the 50th Anniversary celebrations. 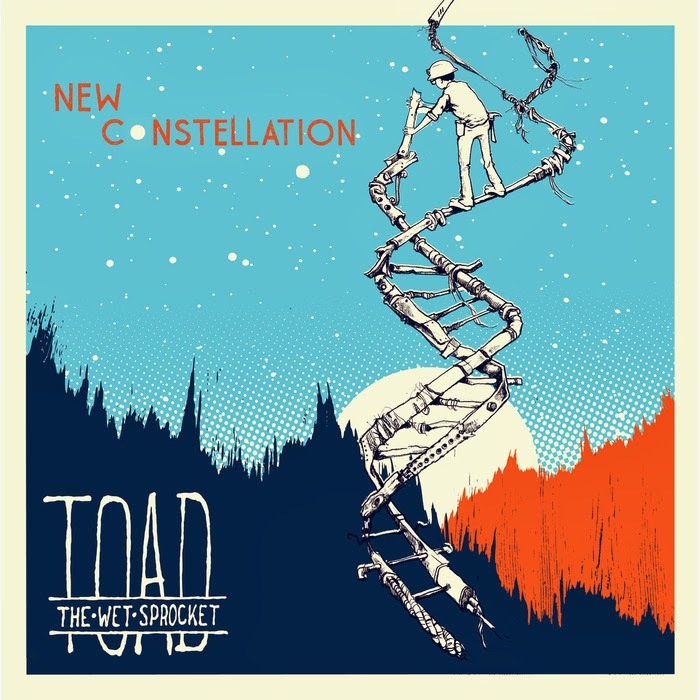 Toad the Wet Sprocket is a garage band that formed in South Carolina in the mid-eighties. Some years later they had a string of minor chart hits, with their unique form of very smooth alternative rock. I liked a few of their well known songs, but I never had any of their albums, and I would not have called myself a fan. When the band broke up in 1998, I barely noticed. I bought their greatest hits a couple years later, but I didn’t listen to it much. Something changed when I moved 3,000 miles from home. Slowly, some things that hadn’t seemed so great before took on a slightly different meaning. I found myself playing that greatest hits album a little more often and asking my English friends if they had ever heard of the band. This mainly got me strange looks (which is a bit unfair – the band name comes from a Monty Python sketch). Unbeknownst to me, the band reformed a few years ago and began work on a new album. Apparently having been burned by the record industry in the past, they decided to self publish and put the album on kickstarter, asking for $50,000. They got the required funding in less than one day, and the album New Constellation was born later that year. My older sister sent me a copy of the album for Christmas. Having given several spins, I’ve got to say I really like it. The best song is probably the title track (you can listen to it below), but there are several other really good ones, particularly ‘I’ll Bet On You’ and ‘Is There Anyone Out There’. In fact, it is an album that I can put on and just let it ride, as long as I turned it off before the last song, which is kind of a dud. So, if you like smooth, alt-rock, try listening to this. If you like it, you’ll probably like the album. If you don’t, you won’t. For the last ten years, Traegan has worked as a guard and a guide for the merchants of Dale. He has travelled to the Sea of Rhun and along the Great Road through Mirkwood. He has journeyed nearly the whole length of the Anduin and visited Isengard, Rohan, and Gondor. Now, he is ready for a new adventure and to see new lands. Thus, he volunteered to join the crew of the Glaurung. Breged and Mandracoth had no hesitation in accepting such an experienced adventurer. Not only is he skilled with a blade, but he has also studied the night sky and can find his way by following the guidance of the stars. 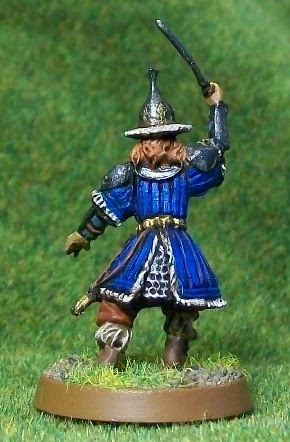 Though he owes no allegiance to Gondor, he provided references from numerous respected merchants. After missing a couple of months with my broken wrist, it is good to get back to work on the story of the Glaurung. 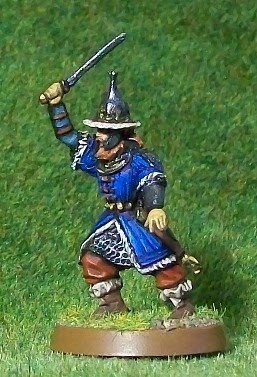 The latest hero to join the quest comes from the Laketown Guardsmen pack, just released this month from Games Workshop, which I purchased with the help of a GW voucher my mother-in-law gave me for Christmas. It’s a notable figure for a couple of reasons. First, it is the first finecast miniature I have painted. For those not in the know, finecast was Games Workshop’s experiment in switching from resin to metal. It has generally been acknowledged by everyone (except GW) to have been a failure (or a disaster, depending on who you speak to), and most people assume it is on its way out. Thankfully my figures were free from the defects that have plagued the line, and the only real issue I have is the somewhat pathetic and hopelessly bent sword (although that could have happened just as easily in metal). What I will say about the figure is that the amount of detail is incredible. Probably the most I have ever seen on a Lord of the Rings figure. This leads to my second point. This figure took me nearly twice as long as usual to paint, almost four hours. That’s not a complaint. It was an enjoyable four hours (watching Hobbit EE extras). That said, it didn’t make me want to dive right in on the other two figures in the pack! Oxford is built on the confluence of two major rivers, the Thames and the Cherwell, and even the name of the city ‘Ox – Ford’ denotes a low place in the river (1). Thus, it really shouldn’t be a surprise to anyone, that after two-and-a-half weeks of consistent rain, the city has flooded. 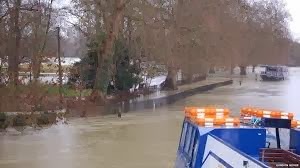 (1) There are some who will says that the official name of the portion of the Thames that flows through Oxford is ‘Isis’, but this strikes me as being both confusing and slightly snooty. Well, I tried my best. 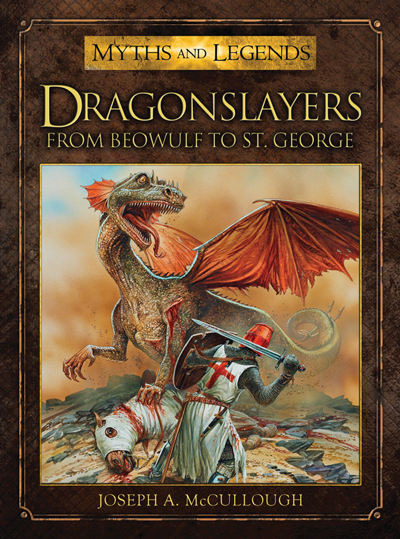 Hopefully the review might encourage a few school libraries to pick up the book. Yes, I'd love to have the sales, but mainly, I know it is the kind of book I wish I could have found in my school library. Last night I sat down and painted my first miniature of the new year, start to finish. I decided to go with an orc because it is also the first miniature I have tried to paint since the cast came off my wrist, and I figure orcs have more ‘margin for error’ than most miniatures. That is, since they are supposed to look scruffy and grimy, a bit of wayward paint here and there wouldn’t be a big deal. Well, the wrist proved no great handicap, and I was thoroughly pleased with the results. I think this specific orc is actually part of an artillery crew, but his pose, and his overall seriousness, make him look like a captain to me. I’m sure he’ll be leading a detachment of orcs in one of my games soon enough. One of the elements I really liked about The Lord of the Rings films was the great variety that Peter Jackson used for the orcs. All of the different body types, skin tones, and facial appearances made the orcs much more visually interesting (especially compared to their beefy younger brothers, the Uruk-hai, who were a bit dull in their uniformity). I haven’t actually been able to spray him with sealer yet, because of the wind and rain. A typical day in England over the last two weeks. Today, loyal Troll readers, I am asking for a little bit of help concerning some dice. Sometime in the distant past, I acquired the pair of ‘Mordor Dice’ pictured here. I love these dice. They are big, easy to read, and have the flaming eye instead of a one. They are the perfect dice to roll for orcs or Nazgul or other servants of the Dark Lord. However, since some of these monsters are able to roll three dice for their attacks in GW’s The Lord of the Rings game, I’d really like to acquire another one or two. Now, if I remember correctly, these dice were associated with The Lord of the Rings collectable card game put out by Iron Crown Enterprises in the nineties. However, I can’t find anything to confirm this online, nor do any of these dice seem to be available on ebay. If anyone has any information on these dice, or even better, has a few they wouldn’t mind parting with, please let me know. I’d also be interested to discover if there were any matching good-guy dice. I know that both Games Workshop and Wiz-Kids produced The Lord of the Rings themed dice, and I might look to acquire some of those at a later date, but I think the ones I’ve got are the nicest that I have seen. It’s a day of new beginnings. Not only is it the first day of a new year, it is also my first full day without the cast on my left arm. My wrist is painfully stiff, and I don’t have anything like a full range of movement, but at least I am on the road to recovery. I have a host of little exercises I’m supposed to perform 3 or 4 times a day. I can now type again with only a bit of discomfort, and later today, I’ll see how I get on working a paint brush. Also, I can now take a shower without wearing a plastic bag over my arm! New Year’s celebrations were quiet around the troll house. Still worn out from the Christmas parties, and with no drinkers currently in residence, we opted for a relaxed night at home. On the plus side, I did get a chance to try out one of the Christmas presents I received from my parents – my starship Enterprise (original series) pizza cutter! Let me just say, for something that is basically a novelty item, it is a seriously good pizza cutter. Easily the best I have ever owned. It’s heavy sharp blade went right through the pizza like it wasn’t even there, threatening to cut into the board underneath. 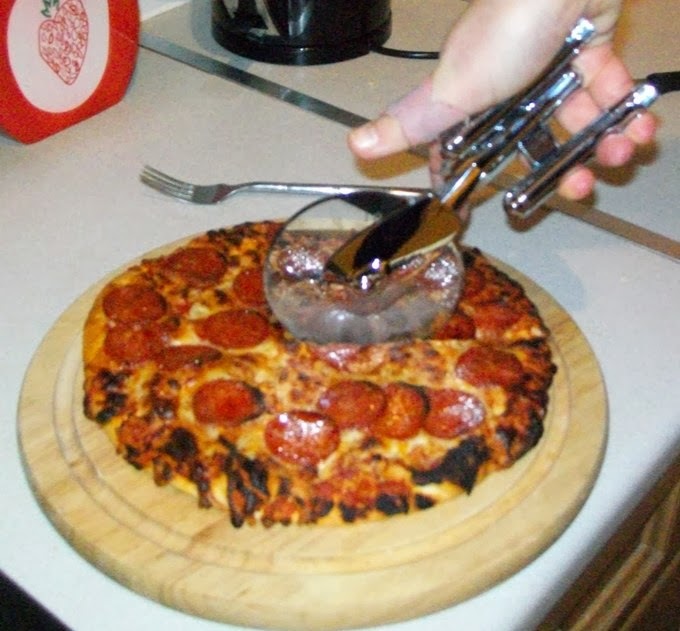 Highly recommended for the pizza-loving geek (are there any geeks who don’t love pizza? ).